Scootours at Middelvlei Wine Estate is a true wine farm experience for the whole family. 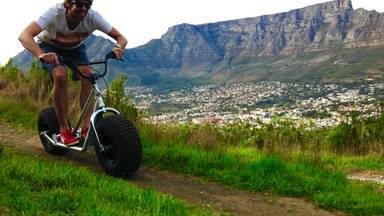 During the tour you will free wheel on a Monster Mountain Scooter through the vineyards of Middelvlei while soaking up panoramic views of the winelands. On a clear day you will be able to see Table Mountain on the one side and Jonkershoek Valley and the Groot Drakenstein Mountains from Stellenbosch on your other side! Guests are transported to the top of each downhill run with an open game drive vehicle which is part of the fun! There will be plenty of time for selfies but tours are accompanied by a photographer who takes great action photos of the tour. We end the tour by having a look at the pictures back at Middelvlei Winery and photos are for sale if you like them. Here you will also get a chance to experience what Middelvlei is famous for as each tour includes a burger, chips and a float for kids and a “braaibroodjie” and a glass of Middelvlei Wine for the adults.